Oscar or no Oscar, Broderick Crawford was obliged to star in whatever property his home studio Columbia threw his way. 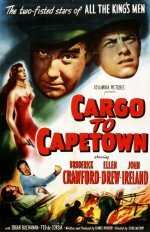 In Cargo to Capetown, Crawford plays Johnny Phelan, first mate on a rundown oil tanker captained by his pal Steve Conway (John Ireland). Johnny is willing to look the other way whenever Steve's larcenous nature comes to surface. But when Steve starts moving in on Johnny's girl Kitty Mellar (Ellen Drew), it's more than he can stand. The two men become buddies again during a climactic shipboard fire. Not exactly a "B" picture, Cargo to Capetown isn't precisely an "A", either.